Final Fantasy XIII director Motomu Toriyama and producer Yoshinori Kitase have addressed concerns that the game is too linear by saying that critics are seeing the game "from a western point of view." The Final Fantasy XIII duo of Motomu Toriyama and series veteran Yoshinori Kitase have been quite active as of late in order to promote the Western launch of the long-awaited RPG. The two have spoken out on topics ranging from a remake of Final Fantasy VII and the state of the Japanese games industry to the idea of DLC in FF13 and a remake of Final Fantasy VII (again). Now, Kitase and Toriyama have taken on the few Western critics who have gotten their hands on Final Fantasy XIII: Speaking with CVG sister site Xbox World 360, the duo discussed criticism of the game's linearity. "We try not to listen to the critics too much. Most of the criticisms have come because the first half of the game is very linear," said Kitase, "But we've got a story to tell, and it's important the player can engage with the characters and the world they inhabit before letting them loose..."
Toriyama chimed in, suggesting that the difference could be a cultural one between Japanese RPGs and Western critics. 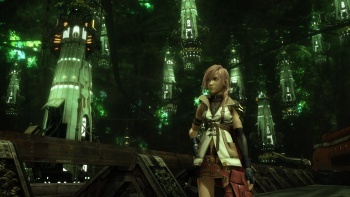 "We think many reviewers are looking at Final Fantasy XIII from a western point of view. When you look at most Western RPGs, they just dump you in a big open world, and let you do whatever you like... [It] becomes very difficult to tell a compelling story when you're given that much freedom." I don't think anyone would disagree that there are certain cultural differences between Japanese RPGs and Western ones like Fallout and Dragon Age. I'm not sure I'm with Toriyama on the idea that you can't tell a compelling story in an open-ended world, though - it's just a different kind of storytelling. With little over half a month to go before Final Fantasy XIII's March 9 release date, the few Western critics to judge the game seem to have mixed opinions on the matter. Game Informer gave the game a 93, calling it a "phenomenal RPG destined to be remembered as a technical milestone," the PS Official Magazine UK followed suit with a 90 - but other outlets like Play UK and Games Master UK were less kind, with scores of 79 and 81, respectively. Is too much linearity a dealbreaker? Or is it just a design choice?